I’m VERY excited to announce that my full length poetry book, The High Shelf, will be published this fall! Publishing a book—and this book in particular—has definitely been on my bucket list, and I’m delighted that it was accepted for publication by the wonderful poetry press The Word Works. And I’m so happy to share the news with you!! This book was a LONG time in the making! I wrote many of these poems right before and after Simone’s birth—when I was a new mother with Gabriel, thinking about having another child, and really feeling the wonderful enormity of bringing life into the world. I’d moved recently to Cambridge to study at Harvard with the poet Jorie Graham—I was in the middle of my PhD program at Columbia and was able to come to Harvard as an exchange scholar and then to stay in Cambridge because I had funding to finish my PhD. I was very eager to write my own poetry, and working with Jorie was a great privilege and opportunity. In Jorie’s class and under her mentorship, I was given the permission to listen deeply to myself—perhaps for the first time. She encouraged her students to listen to our bodies, to take ourselves seriously, to be ambitious. I’d been writing long, complex and often dense poems full of physical details. Suddenly in Jorie’s class I started playing with silence, with taking words out of my poems, with getting quieter, saying less, but having each word mean more. I was surprised by the poems I wrote; I myself wasn’t really sure what I was doing, but I felt like I was following a path. I was slowing down, paying attention, listening to the voice beneath the voice. At the time, I didn’t have a mediation practice, but now looking at the poems, I see that they were their own meditative practice. They were leading me where I was meant to go. One by one the poems are like dots in a constellation, and together the poems tell a story of coming to learn how to listen to myself, how to sit with pain and how to emerge out the other side in the light. The book is about living in time, about making sense of the discrepancies of the world, from its great wonders to its great injustices; it’s about being a mother and a woman, about trauma and about love and healing…and it’s about language and silence and what comes from the two. My poems had a wisdom that my conscious mind did not have, and my poems also knew parts of my story —painful parts, but also resilient part—before my conscious mind knew them. In another post I’ll write more about the process of finally coming to publish this book. 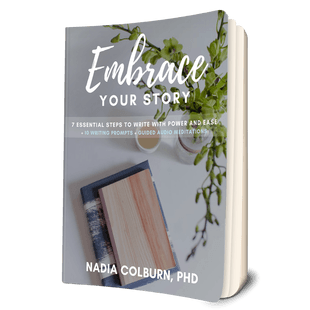 Taking a long time to publish the book was disheartening and at times painful—and I’ll write about that because I hope it gives you encouragement not to give up! But now that the book is going to come out, it also feels like now is really the perfect time for this book. In the past year, I’ve been able to add new poems and finish the book and understand the book in ways I couldn’t when I first wrote it. I’m SO excited to share the book with readers in just a few months! Any moment, the red door. What, what do we not become? And here’s a longer poem, “Pregnancy” also from the book. Imagine laundry on a laundry line. Attached at two points, a white sheet hangs, easily, in air. The sheet dominates, undoing the meaning of sky. In another, the sheet on the line slaps furiously as a white sail on a sinking boat at sea. Now the sheet is secondary. Though it dominates it dominates for something else. Nothingness, because it believes itself the source of meaning, accepts the work the sheet does for it. It wants us to think that the wind, because we cannot see it, symbolizes erasure. It wants us to think into every scene some metaphoric meaning, with itself at center. It takes on the look of the dead sailor, of the submersion of hope in the certainty of dark water. Out in the backyard, the sheet becomes a shroud. Perhaps. On laundry day, it is easy to see force. And to see a fine, clean force in futility. For on laundry day, if everything looks clean, then everything looks as it should be. See how what can’t be seen takes the objects of this world and hurls them about themselves? The sheet sags, comes back, dancing in the colorless light. Every inch of its surface touched by the colorless light. We sit by the picture window. Something’s about to take form. I’m very proud of the product that will be this book, but even more than that, I’m in awe of the power of the writing process to teach us what we need to know; it’s because of that hidden power that I’m so passionate about teaching writing.